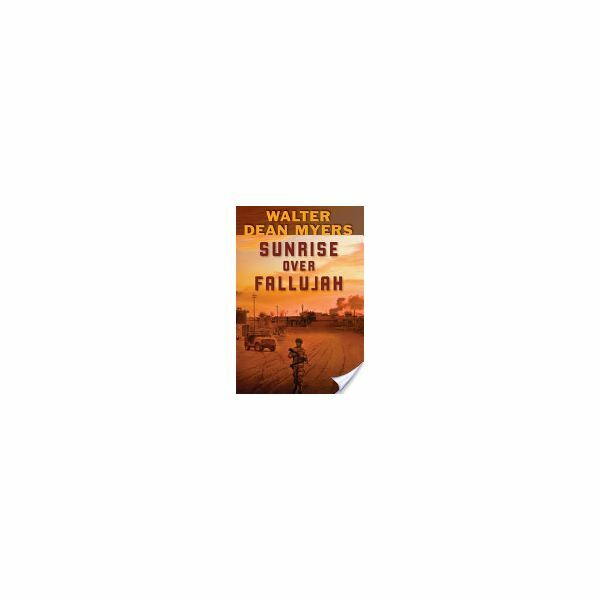 Sunrise Over Fallujah by Walter Dean Myers tells the story of Robin Perry, one ordinary serviceman facing extraordinary circumstances. Nicknamed “Birdy” by his brothers and sisters in arms, Robin forges meaningful relationships despite the horror and pain all around him. Iraq in 2003 is the setting, during the initial days and weeks of the American-led coalition’s fight to oust Saddam Hussein. The reader witnesses scenes from the war in Iraq through Birdy’s eyes as he gradually becomes more disillusioned with the whole mission. In discussing the conflict of the book, Sunrise Over Fallujah stands out because of the multi-layered nature of the struggle. Not only are there soldiers facing the literal, deadly conflict of warfare, there is the internal, doubt-riddled turmoil of the protagonist, Robin “Birdy” Perry. Birdy is part of a Civil Affairs unit, charged with generating goodwill between the Iraqi people and the victorious coalition military. As the weeks pass, the mission of his unit becomes muddled. They are called away on a variety of “extracurricular” activities, engaging in more and more combat operations. Near the end of the book they are used as pawns to solidify the position of a Special Forces unit near Iran. Birdy makes battlefield friends with several members of his unit. Jonesy, a blues man from Georgia, becomes Birdy’s best friend. He develops a crush on Marla Kennedy, a streetwise girl from Long Island. Captain Coles, the unit’s leader, keeps a cool head during crisis situations, a quality that Birdy admires. Birdy and his comrades know that their friendships are tenuous, borne out of fear and isolation as much as anything else. They realize that back in the United States, they likely would not move in the same circles. However, the bonds they form are built on absolute trust and dedication. Birdy struggles both with his own internal doubts and the unspoken disapproval of his father. Birdy has a strong relationship with his Uncle Richie, but his father wanted him to enroll in college rather than the army. Birdy writes letters to Uncle Richie that discuss the combat and his feelings much more personally than to his mother or father. As a reader, it is easy to imagine that Birdy’s father disliked the fact that his brother volunteered to Vietnam. For him, it probably feels like a bad memory is repeating itself. Behind the disapproval, of course, Birdy’s father certainly fears that he will never see his son again. For a young adult just out of high school, Birdy understands remarkably well that he is simply one piece of a large puzzle. The image of the puzzle, however, is unclear. The various military units that Birdy interacts with each have distinct agendas, some of which appear almost at odds with each other. At the same time, the people of Iraq are split along political and tribal lines. Knowing friend from enemy becomes a nearly impossible task, and the penalty for failure is steep. For the most part, the Iraqi civilians adopt a wait and see approach, and are naturally wary of American soldiers offering to help. The irony of trying to make friends after dropping bombs on a city does not escape the members of Birdy’s unit. One of the most unsettling aspects of Sunrise Over Fallujah is that the medical teams are technically forbidden from giving aid to suspected enemy combatants. Sergeant Harris, for one, believes as a matter of principle that anyone who is hurt deserves treatment. Birdy agrees, but understands that the issue is complicated and frustrating. Birdy’s letters and emails to family back home reveal the delicate balancing act required to keep his sense of duty intact. When he writes to his mother, he downplays the fear and loneliness he faces each day — the fear of death, and the loneliness of being so far away from home. To Uncle Richie, Birdy is more straightforward about the reality of war in Iraq. He talks about his doubts and fears, and how the intent of the war has been lost in the dirty, confusing situtation on the ground. Birdy’s only connection with home is the written word, but his choice of words is always calculated and careful. Jonesy’s death marks the climax of Sunrise Over Fallujah. The unit had been commissioned to do dirty work for an entrenched Special Forces unit, which involved deception and kidnapping. Jonesy died protecting a blind child from a firefight, a noble sacrifice during a questionable mission. His death has a profound effect on everyone in the unit, especially Birdy and Sergeant Harris. Until Jonesy’s death, Birdy had not fully experienced the loss that so many others had seen during the war. The event changes Birdy’s outlook on life, death and warfare itself. He writes that he will always carry something heavy inside him that he’ll never be able to express to anyone else. He wonders if it’s the same something that Uncle Richie carries, a secret trauma that lives in the mind and heart forever. Birdy knows that even when he goes home, nothing will feel quite the same. Walter Dean Myers. Sunrise Over Fallujah, Scholastic Press, 2008.